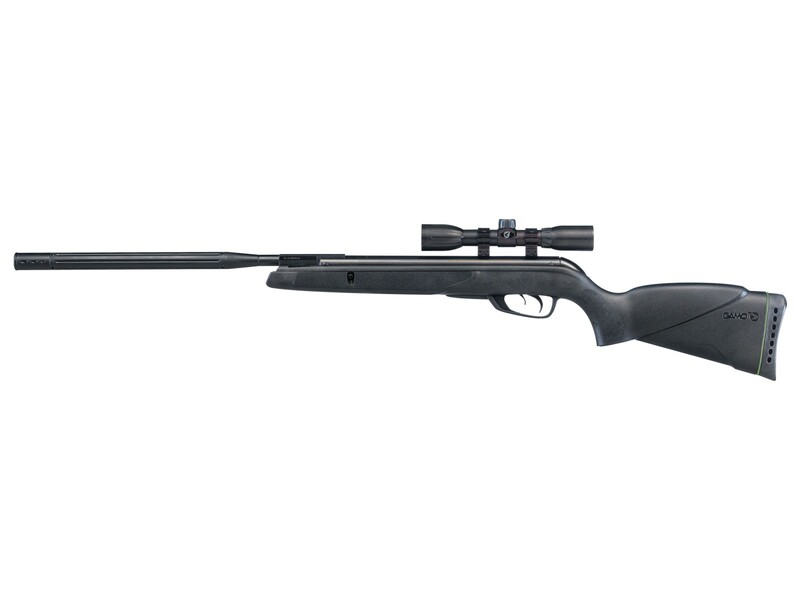 Gamo's IGT (Inert Gas Technology), improves your knockdown power, reduces cocking efforts, and lessens vibrations. Whisper noise dampener reduces the sound by 52%, compared to unsilenced spring guns. The Gamo Wildcat Whisper Air Rifle features the Gamo Inert Gas Technology (IGT) piston to launch pellets for fast, more consistent shots. You'll notice that gas piston pellet guns are very smooth cocking, they function better in cold weather, and have a longer lifespan than traditional, metal spring powered guns. With speeds of up to 1350 fps in .177 caliber and 975 fps in .22, this gun is ideal for your small game hunting and pest control needs. And because this gun is outfitted with the Whisper Technology, this ultra quiet rifle is less likely to spook your quarry and more likely to hit your intended target. Smaller targets are easier to see with the included 4x32 scope. Things I liked: Very accurate with the right pellets once broken in. Nice stock and good trigger. Comfortable to shoot. Things I would have changed: The scope is just OK. Not high end. What others should know: Expect to shoot about 200 pellets to break it in. Mine loves the Gamo Match Pellets. RWS is ok and Crosman don't shoot well. Things I liked: Good looking solid rifle. The "Whisper" teck part make it much less loud than another rifle of the same quality. It is no louder than the old less powerful one I have uised for years. Things I would have changed: More mechanical advantage in the cocking part. It is no harder than other brands but for an old codger it is a bit hard. Younger, I would have no problem. I can do it and just need to get a system I think. What others should know: It is accurate, the whisper technology works. You still get noise but manageable. Things I liked: Very accurate. Scope works well. Light weight. Shoots well with many pellet brands. What others should know: Good gun for the money. .
ARE THERE ANY DIFFERENCE IN POWER AND ACCURACY ONLY BETWEEN THIS RIFLE AND THE RAPTOR, HORNET MAXXIM AND BONE COLLECTOR MAXXIM? I DO NOT CARE ABOUT OTHER FEATURES AS CAT TRIGGERS/SWA/RRR/WHISPER MAXXIM SILENCER. IS THE RECEIVER OF THIS RIFLE IN THE DOVETAIL PART, MADE OF STEEL OR ALUMINIUM? I HAVE SEEN STOP SCOPE HOLE BROKEN BY THE PIN MOVEMENT. IN THE UTG ACCUSHOT 1 PC RINGS, THE PIN FEELS VERY TIGHT.